The first thing I did was colour every second cycle, starting with the one I'm on now... Each row has four columns standing for Last Menstrual Period (so the date from which my last cycle started), the Estimated Date of Delivery, calculated from my LMP (and based on a 27 day cycle, which I usually have), then I added 12 days, because that's how long I went over with Bryn who was my only natural commencement of labour baby), and the last column shows how old each of the boys will be in years/months. The Stars show which cycles would be great, and two stars show my ideal cycle. Sif, thank you for posting this so I know I'm not the only nut who thinks like this!!! 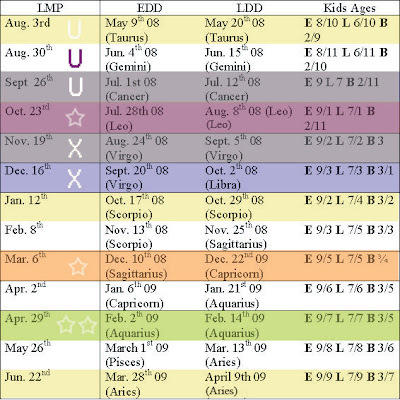 LOL Your chart is prettier than mine though! Wow, you are a crazy cool cat! That is sure some elaborate way of procrastinating Uni work LOL! I love it! I would never ever in a million years thought to draw up a chart like that - but I LOIKE it! And I agree, it is pretty too!